There has to be something wrong with Indian society for it to allow its children to be among the most deprived and malnourished in the world. Across castes and social classes, there is so little attention given to the inalienable right of a child to enjoy a childhood of good health, education and a nutritious diet. How can we get a society of adults to be accountable for the treatment of its youngest citizens? Several reports from international organizations like UNICEF and the World Bank have been sharply critical of the abject failure of governance in health and education that has left Indian children way behind their counterparts in Sri Lanka, Nepal and even Bangladesh. 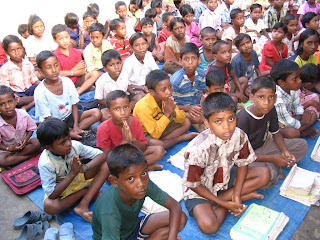 According to some recent statistics, two million children below the age of five die every year in India. That’s one every fifteen seconds which, shamefully, is the highest figure in the world. But let’s just focus on primary education for the moment. Through my own experiences of teaching in an under-resourced Bombay school for the last six months, some sights and sounds have become permanently etched in my mind – the family of five who cannot afford to send all their children to school, and therefore picked two, a girl and a boy; the beatings that a 3rd grade student can receive at home for scoring poorly on an exam that tests little more than memorization; young kids reciting poems in fluent English without understanding a word of what they’re saying. Primary education here largely involves the teacher playing narrator in the classroom. Students are receptacles who must memorize and then mechanically parrot away the narrated content. The more meekly they reproduce what has been written on the blackboard onto pen and paper, the better students they are. For education here is little more than an elaborate ritual of filling student notebooks and issuing communiqués which students patiently receive, memorize and repeat. But it’s quite apparent now that this factory-schooling model is not only dysfunctional but also destructive towards the myriad processes of human learning and growth. Pupils have to be encouraged to independently develop their own creative thinking processes. Curriculums have to be re-worked to foster a sense of competence, purpose and responsibility into students. And also equip them with a vital understanding of ethics and social responsibility. As young kids are forced to submit to rote learning, they lose the critical consciousness they will need to intervene and transform their country in the years to come. As they embrace educational passivity, they will also more readily accept the imperfections and injustices their societies impose on them. Ever since Jawaharlal Nehru decided in the early 50s to develop India’s higher education platform to compete technologically in the Cold War era, the importance of primary education in the country has been largely ignored. Instead the nation focused on building institutions that could produce more engineers, doctors and scientists. But how can we sustain these specialized programs without building sturdy foundations at school? Or rather, what quality of engineers and scientists must we be producing at these institutes of excellence? Excluding the IITs, what percentage of Indian graduates are able to compete effectively in the global economy? As the Indian educational debate remains sharply focused on colleges and universities, it is worth remembering that elementary education is the foundation on which the promise of equal opportunity exists. Much work needs to be done towards making the primary education system accountable to the child for what she learns, and how she learns it. And we’re possibly in the worst of situations at the moment – more than 1 in 3 children who begin primary school will drop out before 5th grade and World Bank statistics show that less than 40% of Indian adolescents are attending secondary school. In this context, the new Right to Education Bill is being hailed as India’s great solution but alas, it is only a sketchy blueprint that has yet to be implemented effectively. And then again, the bill only caters to children above the age of six. Meeting the nutritional and developmental needs of children under the age of six is critical for the educational journey they will undertake. But there is not enough public attention to this omission in the new bill. For India’s children, things will clearly not change by themselves. If it takes a village to raise a child, it might take the whole nation to raise the ten million children born annually in India. There is a serious need for much more material that can be used for playful learning, and a need for more simple storybooks, which affluent children have easy access to. Urban slum children have no such resource, either at school or at home. For a country like India, where almost 40% of the population is under the age of fifteen, this paints a highly disturbing long-term trend. And talking globally, 25% of the entire global workforce will be Indian in about twenty years – so be sure that the quality of education these kids receive is going to impact us all. But perhaps this is not about numbers, or about economics. Maybe the harshness of the statistics tells us that there is something more sinister at play – that the dialog shouldn’t be about resources or economics at all but instead a debate on our values. Author Rakesh Mani is a 2009 Teach for India fellow, working with low-income schools in Mumbai. He is also a New York-based investment banker, freelance writer and commentator who contributes to a variety of publications. As a volunteer for "Teach For India", Mr. Mani is inspiring others by personal example. Teach For India is a nationwide movement of outstanding college graduates and young professionals who will commit two-years to teach full-time in under resourced schools and who will become lifelong leaders working from within various sectors toward the pursuit of equity in education. While there is no Pakistani equivalent of "Teach For India", there are a number of organizations such Human Development Foundation (HDF) and Development in Literacy (DIL), and Greg Mortenson's Central Asia Institute, which are focusing on improving primary education and promoting literacy in Pakistan. Riaz Haq's Note: This article focuses on the state of India's children, and raises fundamental questions about society's values. However, I find Mr. Mani's thoughts to be equally, if not more, applicable to Pakistan as well. Under former President Musharraf, Pakistan followed India's lead by focusing on tertiary education with the higher education budget rising 10-15 fold in a short period of time. Unfortunately, there was no commensurate increase or focus on primary or secondary education. As a result of the long neglect, Pakistan's primary and secondary public education is in shambles with insufficient funds, rampant corruption and ghost schools that exist only on paper with fictitious staff drawing salaries and perks. This lack of focus on access and quality of children's education has resulted in the proliferation of madrassahs, some of which are highly radicalized, that fill the vacuum by offering a one-stop shop for poor children needing food, clothing, shelter, healthcare and basic education. Parents simply drop their children off at these madrassas, and essentially let these institutions raise their children, and brainwash the children in some cases. As Pakistan now fights an existential battle against extremely violent radicals, many from the radical madrassas, the nation is now paying a heavy price for years of neglect. Upon the urging of saner elements in Pakistan, and pressure from the alarmed world, a new education policy has recently been announced that will more than double education spending in Pakistan from about 3% of the GDP to 7%. If it is done correctly, instills proper values, and with transparency, then there can be hope for light be at end of the tunnel for Pakistan's younger generation. Can Slumdog's Success Improve Children's Lives? Further the situation has worsened with the recession that the first to get hit is "return back to the society / donation"
Some where the money has become god across caste, creed religion, race and color. It is so pathetic how India is a rising global superpower whilst many Indians remain left behind. Even worse, it's despicable when upper caste/elite Indians want to deny the poverty and reality of Indian society. I donot agree. Every body has to own the responsibility of the children. Today a quick analysis of the family pattern will bring out the contrasting fact that the more affordable people have lesser children and the less affordable have more children. Whose mistake is that. Government promotes smaller family and the individual chooses to have a bigger one and then blame the government and the society for the same. Carefull analysis will show the effectiveness of the family planning in the southern state and the better standrad living. Vice versa is the truth in the BIMARU states being bihar, mp, rajasthan and UP. This particular phenomenon is applicable across caste, creed and religion. Surprisingly India spend 3.5% of GDP on education which is higher than China. Of course greater emphasis has been laid on tertiary education. In comparision, expenditure on health is a mere 1% of GDP. I am talking about public expenditure. Pakistan spends even less. Most countries spend an equal if not higher amount on health. I think there is something wrong with priorities since you can educate only healthy surviving children. Both countries spend between 3% (India) and 5% (Pakistan) on defence. Military muscle and nukes have not helped the lot of the poor and downtrodden. Just another interesting statistic. Bangladeshwith a per capita GDP of $431 spends about $8.5 on health. India with a per capita GDP of $1046 spends $7 and Pakistan comes a poor third with a per capita income of $879 spending a mere $2.6 on health. Figures from the 2009 UNDP Human Development Report. The main problem I think lies it it's population. India's population is increasing at a rate faster than people can be pulled out of poverty. Government is also rather inefficient compared to other countries. Population control is key. China could not be where it is today if it didn't control their population growth. There is no way that any of the countries in South Asia with the possible exception of Bangladesh will come anywhere close to achieving the MDGs. I think the figure of 240 million kids below age five is incorrect. It would be about half that number since the number of malnourished kids is about 60 million which is about half the total number. We add about 28 million kids each year of which nearly 2 million die.